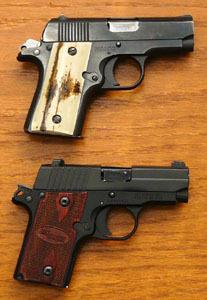 The SIG is essentially a copy of the Colt. The magazines, and probably some other parts, are interchangeable. 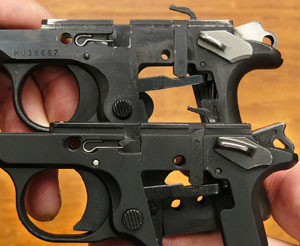 There are a few minor differences, the most salient of which are the breech locking methods and the hammer spring assemblies. 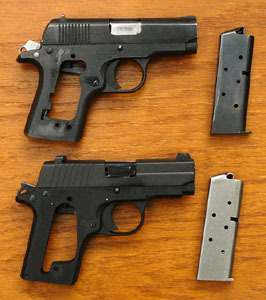 The SIG has a more squared-off slide. 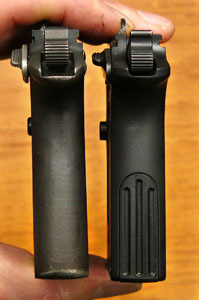 The Colt has a single lug on the barrel which interfaces with a cut in the top of the slide to lock the breech. The SIG has a shoulder in front of the chamber that locks against the front edge of the ejection port--a feature which first appeared on the French SACM 1935S, the design for which was licensed to SIG in 1937 and has appeared on most of their pistols since. 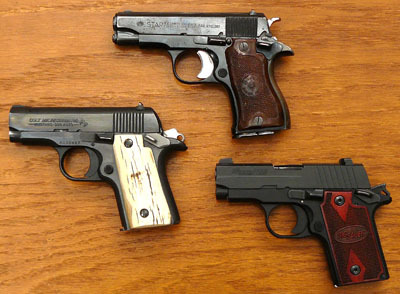 I believe it was Star that first got the idea to make a mini-1911 in .380 caliber. The Spanish guns proved so popular that Colt eventually decided to get in on some of the action. But Colt didn’t make them for very long, and now the original Colt Mustangs fetch prices that are way out of proportion to their quality. 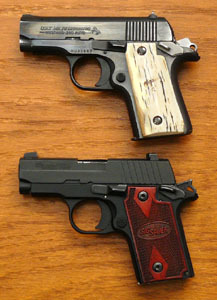 The SIGs are pricey, but they are somewhat cheaper than a used Colt Mustang. Top: Star DK. 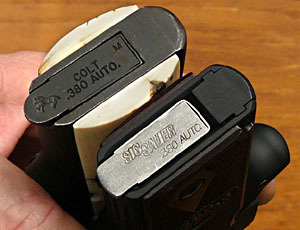 Left: Colt Mustang. 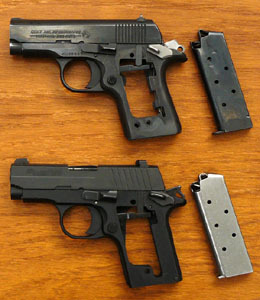 Right: SIG P238. Article & photographs copyright 2009 by Ed Buffaloe. All rights reserved. Click photographs to open a larger version in a new window.